Self-contained eyewash/drench hose unit is ideal for use in low traffic areas, and where a continuous supply of potable water is unavailable for plumbed units. 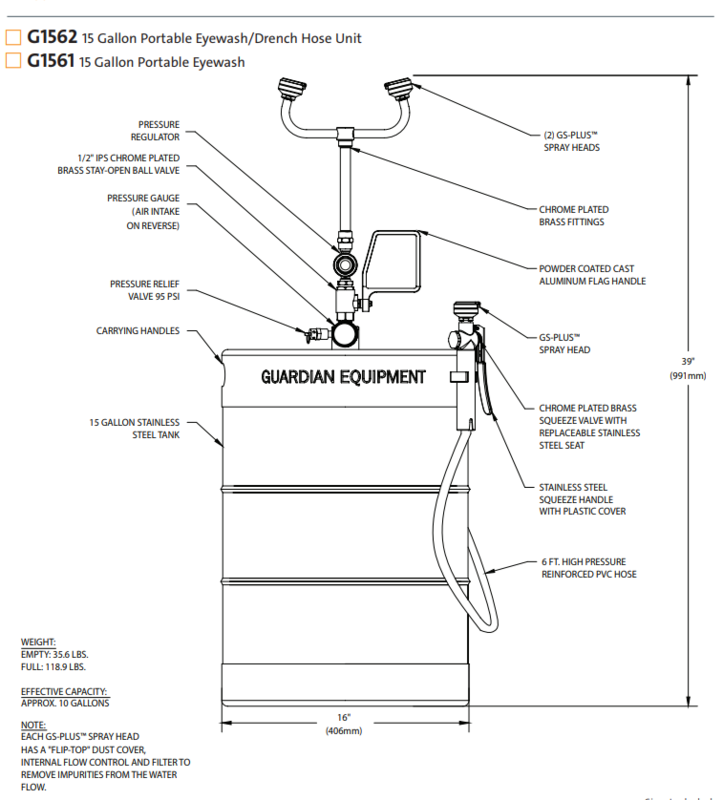 15 gallon pressurized unit is ideal for floor placement near any hazard, and delivers approximately 10 usable gallons (37.9 liters) of water for 15 minutes, thus complying with the provisions of ANSI Z358.1-2014 for eyewashes. 15 gallon stainless steel pressurized tank with 10 gallons (37.9 liters) usable capacity. Tank has built-in carrying handles, Schrader air intake valve, pressure gauge and pressure relief valve. Two GS-Plus™ spray heads. Each head has a “flip top” dust cover, internal flow control and filter. 1/2” IPS chrome plated brass stay-open ball valve with flag handle. Pressure regulator controls eyewash flow to 0.65 GPM for 15 minutes. Auxiliary hand-held drench hose for rinsing eyes, face or body. Unit has single GS-Plus™ spray-type outlet head, self-closing valve with squeeze handle, and 6 ft. reinforced PVC hose. To operate unit, fill with clean potable water and add bacteriostatic additive (supplied with unit). Additive protects against growth of bacteria, fungus, algae and acanthamoeba. After filling with water, pressurize unit to 80 PSI. If necessary, adjust pressure regulator to achieve maximum flow for 15 minutes. Unit should be inspected regularly and water should be changed at least once every six months. Filling instructions included. 35.6 lbs. empty, 118.9 lbs. filled. ANSI compliant identification sign permanently affixed to tank. Unit is fully assembled, pressurized and water tested at the factory. Unit is depressurized and emptied prior to shipping. Some assembly required in field.